E4001.1 Rating and application of snap switches. E4001.4 Time switches and similar devices. E4001.7 Damp or wet locations. 1. Where a means to connect to an equipment grounding conductor does not exist within the snap-switch enclosure or where the wiring method does not include or provide an equipment grounding conductor, a snap switch without a grounding connection to an equipment grounding conductor shall be permitted for replacement purposes only. A snap switch wired under the provisions of this exception and located within 8 feet (2438 mm) vertically or 5 feet (1524 mm) horizontally of ground or exposed grounded metal objects, shall be provided with a faceplate of nonconducting noncombustible material with nonmetallic attachment screws, except where the switch-mounting strap or yoke is nonmetallic or the circuit is protected by a ground-fault circuit interrupter. 2.4. All parts of the device that are accessible after installation of the faceplate are manufactured of nonmetallic materials. 3. Connection to an equipment grounding conductor shall not be required for snap switches that have an integral nonmetallic enclosure complying with Section E3905.13. Where snap switches are used to control cord-and-plug-connected equipment on a general-purpose branch circuit, each snap switch controlling receptacle outlets or cord connectors that are supplied by permanently connected cord pendants shall be rated at not less than the rating of the maximum permitted ampere rating or setting of the overcurrent device protecting the receptacles or cord connectors, as provided in Sections E4002.1.1 and E4002.1.2. E4001.15 Switches controlling lighting loads. Where switches control lighting loads supplied by a grounded general purpose branch circuit, the grounded circuit conductor for the controlled lighting circuit shall be provided at the switch location. 1. The conductors enter the box through a raceway. The raceway shall have suffÄ±cient cross-sectional area to accommodate the extension of the grounded circuit conductor of the lighting circuit to the switch location whether or not the conductors in the raceway are required to be increased in size to comply with Section E3705.3. 2. Cable assemblies enter the box through a framing cavity that is open at the top or bottom on the same floor level, or through a wall, floor, or ceiling that is unfinished on one side. E4002.1.2 Two or more receptacles. E4002.5 Position of receptacle faces. After installation, receptacle faces shall be flush with or project from face plates of insulating material and shall project a minimum of 0.015 inch (0.381 mm) from metal face plates. Faceplates shall be installed so as to completely cover the opening and seat against the mounting surface. Receptacle faceplates mounted inside of a box having a recess-mounted receptacle shall effectively close the opening and seat against the mounting surface. E4002.6 Receptacle mounted in boxes. E4002.7 Receptacles mounted on covers. E4002.9 Fifteen- and 20-ampere receptacles in wet locations. E4002.10 Other receptacles in wet locations. E4002.11 Bathtub and shower space. E4002.12 Flush mounting with faceplate. 3. A single receptacle for a single appliance or a duplex receptacle for two appliances where such receptacles are located in spaces dedicated for the appliances served and, under conditions of normal use, the appliances are not easily moved from one place to another. The appliances shall be cord-and-plug-connected to such receptacles in accordance with Section E3909.4. E4003.2 Luminaires near combustible material. E4003.8 Metal halide lamp containment. E4003.9 Wet or damp locations. E4003.10 Lampholders in wet or damp locations. Lampholders installed in wet locations shall be listed for use in wet locations. Lampholders installed in damp locations shall be listed for damp locations or shall be listed for wet locations. E4003.11 Bathtub and shower areas. E4003.12 Luminaires in clothes closets. 5. Surface-mounted fluorescent or LED luminaires shall be permitted to be installed within the closet storage space where identified for this use. Luminaires shall not be used as raceways for circuit conductors except where such luminaires are listed and marked for use as a raceway. Luminaires used as a raceway shall be identified for through-wiring. Luminaires designed for end-to-end connection to form a continuous assembly, and luminaires connected together by recognized wiring methods, shall not be required to be listed as a raceway where they contain the conductors of one 2-wire branch circuit or one multiwire branch circuit and such conductors supply the connected luminaires. One additional 2-wire branch circuit that separately supplies one or more of the connected luminaires shall also be permitted. E4004.2 Combustible material at outlet boxes. Luminaires shall be installed so that the connections between the luminaire conductors and the circuit conductors can be accessed without requiring the disconnection of any part of the wiring. Luminaires that are connected by attachment plugs and receptacles meet the requirement of this section. Luminaires having exposed ballasts, transformers, LED drivers or power supplies shall be installed so that such ballasts, transformers, LED drivers or power supplies are not in contact with combustible material unless listed for such condition. E4004.7 Combustible low-density cellulose fiberboard. Where a surface-mounted luminaire containing a ballast, transformer, LED driver or power supply is installed on combustible low-density cellulose fiberboard, the luminaire shall be marked for this purpose or it shall be spaced not less than 11/2 inches (38 mm) from the surface of the fiberboard. Where such luminaires are partially or wholly recessed, the provisions of Sections E4004.8 and E4004.9 shall apply. A recessed luminaire that is not identified for contact with insulation shall have all recessed parts spaced at least 1/2 inch (12.7 mm) from combustible materials. The points of support and the finish trim parts at the opening in the ceiling, wall or other finished surface shall be permitted to be in contact with combustible materials. 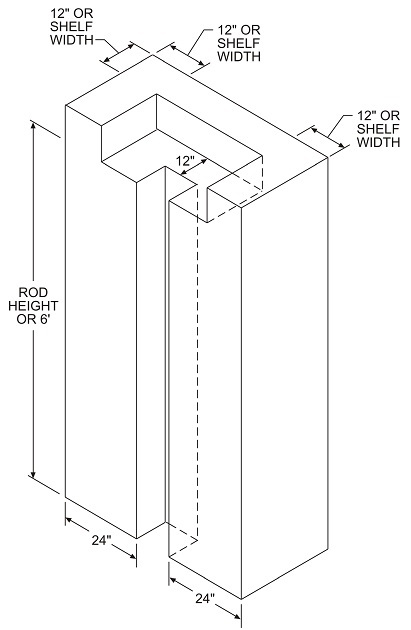 A recessed luminaire that is identified for contact with insulation, Type IC, shall be permitted to be in contact with combustible materials at recessed parts, points of support, and portions passing through the building structure and at finish trim parts at the opening in the ceiling or wall. Thermal insulation shall not be installed above a recessed luminaire or within 3 inches (76 mm) of the recessed luminaire’s enclosure, wiring compartment, ballast, transformer, LED driver or power supply except where such luminaire is identified for contact with insulation, Type IC. The connected load on lighting track shall not exceed the rating of the track. The rating of the branch circuit that supplies the track shall not exceed the rating of the track.